PUBLIC NOTICE: The Commission on Accreditation of Medical Transport Systems will conduct an accreditation site visit of Lehigh Valley Health Network—MedEvac on February 21 and 22, 2019. Lehigh Valley Health Network (LVHN)-MedEvac provides air and ground critical care transportation for patients requiring access to tertiary care in northeast Pennsylvania. Based in the Lehigh Valley, LVHN-MedEvac transports patients to, and retrieves patients from, as far away as Massachusetts and Ohio. We provide critically ill and injured patients access to Lehigh Valley Health Network’s care, which includes the region’s premier Level 1 trauma center, Pennsylvania’s first Comprehensive Stroke Center and the region’s only American Burn Association (ABA)-verified Burn Center. LVHN-MedEvac has completed more than 30,000 missions since beginning operations in 1981. We were the second air medical transport service in Pennsylvania and the first in northeast Pennsylvania. We currently operate four helicopters and one ambulance 24 hours a day/seven days a week. A second ambulance is on duty 12 hours a day. Both our air and ground transport programs are accredited by the Commission on Accreditation of Medical Transport Systems (CAMTS). Lehigh Valley Health Network's MedEvac crew is ready to respond to an emergency 24/7 with its helicopter or ground fleet. The primary purpose for using a helicopter for medical transport is to save time while maintaining appropriate, specialized critical care capabilities for the patient. This applies in cases where getting the patient to appropriate care quickly is essential and also in situations necessitating minimizing time outside of the critical care facility. 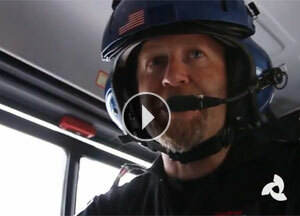 We recognized an unmet need in northeast Pennsylvania and in 2013, launched our critical care ground transport service. This program is designed to complement our air transport service in many ways. For years, patients requiring transport to tertiary care were only able to be transported by paramedics in an Advanced Life Support (ALS) ambulance. Any treatment/therapy that was beyond the scope of paramedic care had to be withheld until the patient reached the destination facility, or the sending facility had to send a nurse with the patient in the vehicle. All MedEvac vehicles, whether helicopter or ambulance, are staffed by experienced critical care professionals capable of administering care beyond the scope of ALS ambulances. MedEvac staff includes paramedics and registered nurses, as well as pilots (air) and emergency medical technician (EMT) drivers (ground). When not transporting patients, MedEvac crew members support colleagues in our emergency departments and critical care units to maintain their skill and proficiency in advanced critical care. Our existing flight crews also work ambulance shifts so they are comfortable in either mode of care. All staff members, new and veteran, develop their field skills by training and working shifts in a variety of critical care settings. Efficient and highly effective communications and computer technologies combined with an ongoing state of preparedness enable our crews to respond quickly and safely to critical situations. Each member of our team, which includes flight nurses, flight paramedics, EMTs, pilots, mechanics and communications specialists, is specially trained for critical care medical transport and works diligently to keep ambulances, aircraft and equipment ready to respond at a moment’s notice. Experience is our greatest asset. Patients of all age groups are included – from pediatrics to geriatrics to and everything in between. The geographical coverage area for LVHN MedEvac includes eastern Pennsylvania, southeastern New York and all of New Jersey.